The holidays are the best time where you can meet friends and family you haven't seen for months... One of my good friend Tony came to Montreal for the holidays and invited him to join one of the cooking sessions. The first dish was cooked by my Taiwanese friend Chris known as Hong Shao Yu meaning Red Cooked Fish. This is one of the oldest and familiar method known in Chinese cuisine. This is done by slowly braising the meat in soy sauce. 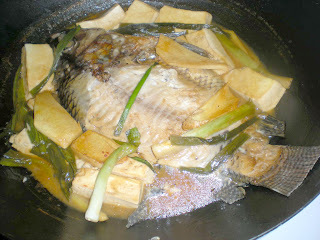 This is the first time that we use a whole fish for the cooking session. 1. Pour enough oil to cover the bottom of the wok. Heat oil over medium-high heat. Fry fish on both sides, about 1-2 mins each until slightly brown. 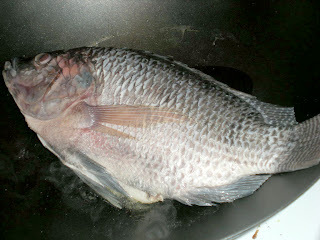 Remove fish and drain oil. 2. In the same wok, add soy sauce, sake, sugar, vinegar, green onions, ginger, tofu and ketchup. Stir and add 1 1/2 cup of water. Bring to a boil and simmer for 5 mins. 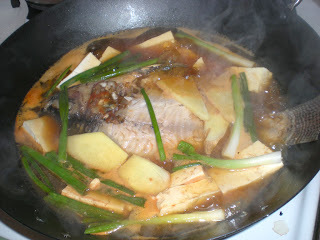 Bring back fish to wok, cover and simmer for 10 mins. 3. Serve the fish along with a bowl of rice. I have yet to attempt to cook a whole fish like this. (the only whole fish I've cooked are trout, which are much smaller!) This sounds tasty. Mmmm, I love tilapia... But I've never tried poaching it whole. Although I guess this could be done with chunks of fish, too. At any rate, it sounds delicious! Ah! when in the hands of a master. Outstanding recipe, outstanding presentation and you make it easy and clear. What more can we ask for besides a bite of this marvelous dish.